The park also contains a statue of Lord Buddha located in the middle of the lake on a raised platform. There are many attractions in and near the park. The attraction of this park is Laser Show that takes place every day. The best part of the Laser show is when the laser is used to create a 3D city. There is also a musical fountain in which the water from the synchronized fountains is released in accordance with the tunes being played which are generally in Telugu. The timing of the musical fountain is from 6.30 P.M. and 8 P.M. In Lumbini Park there is the huge clock decorated with colourful flowers located at the entry point. There is a toy train and wave pool exclusively available for children in this park. Visitors can spend Around 3 to 4 hours easily in this park. Telugu and English languages are used in this place. The best time to visit in this place is October to March. Tourist can visit Lumbini Park all days of the week except Monday. The timing of this park is 9:00 AM - 9:00 PM. In Summer : The temperature in the summer is 20 degree Celsius to 45 degree Celsius. In Winter : The temperature in the winter is 14 degree Celsius to 32 degree Celsius. By Air : Rajiv Gandhi International airport is the nearest airport. This airport is located in the Hyderabad. By Rail : Hyderabad Railway Juction is the nearest railway station. 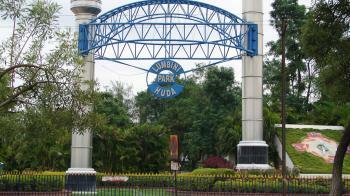 By Road : Lumbini Park is well connected to all major cities.